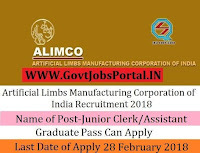 Artificial Limbs Manufacturing Corporation of India is going to recruit fresher candidates in India for Assistant Manager, Junior Clerk/Assistant Posts. So, those candidates who are willing to work with this organization they May apply for this post. Last Date of Apply 28-February-2018. Total numbers of vacancies are 64 Posts. Only those candidates are eligible who have passed Engineering degree in Mechanical / Electrical / Electronics Engineering with minimum 55% marks (Desirable 60%) from recognized university / institute. 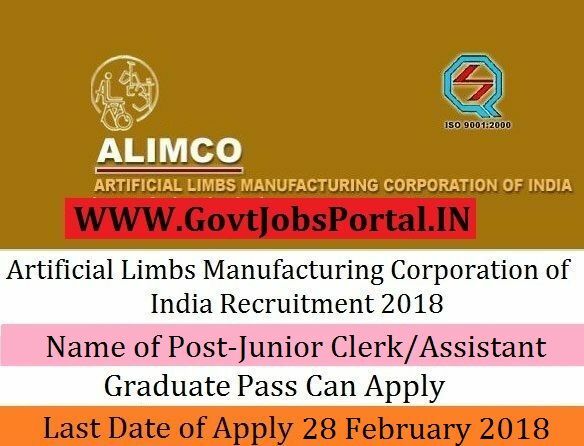 Indian citizen having age in between 20 to 40 years can apply for this Artificial Limbs Manufacturing Corporation of India Recruitment 2018. Educational Criteria: Only those candidates are eligible who have passed Engineering degree in Mechanical / Electrical / Electronics Engineering with minimum 55% marks (Desirable 60%) from recognized university / institute. What is the Application Fee for these ALIMCO Jobs in India?